Giving Food Thanks & Thanking Some Farmers Too! - JP loves LIFE! 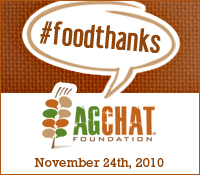 Giving Food Thanks & Thanking Some Farmers Too! Having lived in New York metro, this video rings so true for me. Since I’m on vacation today, seems a great way to start my morning by taking a minute to quietly thank a farmer (actually several helped produce my breakfast of a chicken biscuit — chicken, wheat, eggs, milk, tea, potatoes) and offering #foodthanks by telling my niece thank you as she brings me breakfast (love that). If you have friends who farm, tell them thanks! Write a short note on this website people at my office did. You should also browse a bit as there are several neat components including a profile of a friend (Ray Sneed shown here on my blog last spring) who’s family farms in the Memphis area. I hope you have an incredible holiday whether you produce the food on the table, cook it, serve it or simply enjoy it! Hi JP–I am a new visitor here and think these are some great action items for people from all backgrounds to be thankful for their food and farmers here in the US. Good stuff!